by Nimi Wariboko. Wipf and Stock, 2013. As a professor of Christian Ethics, it isn’t surprising that Nimi Wariboko would have an interest in helping pastors reflect on their theology of money. Yet Wariboko is interested in pastors learning more than theory. Wariboko believes that a congregation’s identity and mission are intimately related to finances, and pastors must first understand the basics of money, accounting, and financial records before they can understand or assess their congregations. 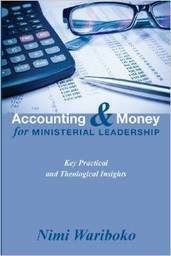 Only then, he says, can pastors see how “accounting, financial management, and [a] theology of money” inform and reveal the overall well-being of a congregation. Consequently, Wariboko’s work is a tutorial in accounting and more. Among other things, Wariboko discusses the need for internal controls, budgeting, the IRS and religious institutions, possible legal issues, and how to read and interpret financial records. Each chapter addresses the theological implications and ramifications of a given topic. A detailed index rounds out the book.